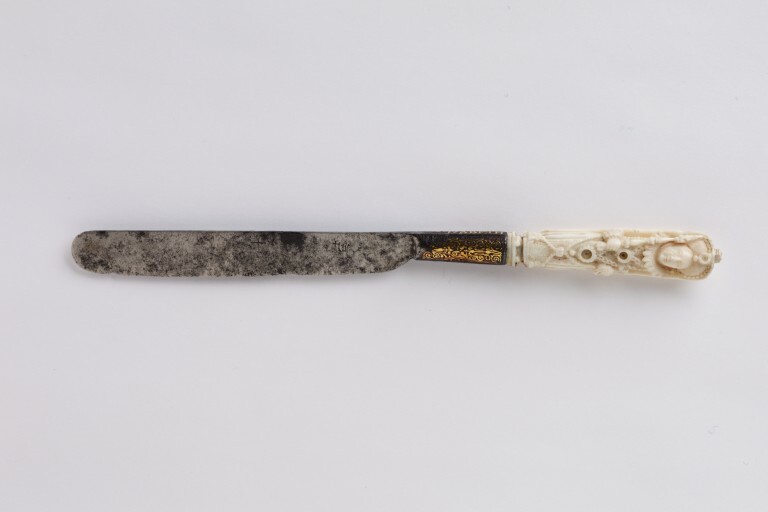 This knife of ivory with a steel blade damascened in gold and silver, represents a full figure of Queen Elizabeth I of England holding an orb and a sceptre. The object is likely to date from the late sixteenth or early seventeenth century, during Elizabeth I's reign. Ebony, ivory, fish skin, tortoiseshell, amber, bone, horn and shell were all popular for decorating cutlery. Around 1730 ceramic handles were introduced to Europe from China. Although cutlers were required by their guilds to be able to make a complete knife, handles of carved ivory, silver, bronze and glass were usually imported or made by specialist craftsmen. Knife with an ivory handle carved with a full length figure of Queen Elizabeth I, holding an orb and a sceptre. The ferrule is damascened with gold and silver. Given by Miss E. Jane Urwick, Vauxhall Bridge Road in 1925.